About eight months ago I took up skateboarding as a new hobby/workout. One day I spent more time watching the boys at the skatepark than I skated. It got me thinking. These guys can teach us a lot about what it takes to be successful in business, and in life. So, in honor of “Go Skateboarding Day”, here are 12 lessons I learned at the skatepark. 1. You gotta have dedication. Skateboarding is hard. It takes real dedication of time and energy to learn how to skate. Starting a business takes the same amount of time and energy. You have to be dedicated to what you are doing for it to work. You have to push past fears, pain, failure, and more to get any good at skating. If you’re not dedicated, you won’t succeed. 2. You fall a lot! When you’re learning something new, you’re going to fall a lot. Stand at the gate of a skatepark and you see more falls than you do anything else. I watch skaters fall 100 times trying to land a single trick. 3. You need others to challenge you. To push you to new heights. I’ve gone to the park by myself to skate many times. But it’s rare in those times that I am pushed to learn something new. But when I’m with a group of others, they are teaching me, inspiring me, and pushing me to try new things, to reach new heights, to challenge my limits. Same is true in business. Sure, you can go it alone. But you will be more successful if you are surrounded by other business owners who will support you along the way. 4. You fail before you succeed. Actually, you’re probably going to fail a LOT before you succeed. Skaters know that their first failed attempt at a trick is nothing. You pick your board up, you make an adjustment, and you try again. And probably fail again. So you pick the board back up, and make another small adjustment, and try again. Failure is a part of learning. In business, you will fail. You will run a Facebook ad campaign and get nothing from it. You may send out email campaigns that have zero opens. Your website might get hacked. No big deal. Failure teaches you to make some small adjustments and try again. Keep trying until you find what works for you. 5. Getting hurt is part of the process. But you gotta pop right back up. When you fall, sometimes you’ll get hurt. But you can’t let a little pain stop you. I have seen some really gnarly falls. Shoot, I’ve had some myself. I have been amazed at how quickly some of these guys jump right back on their board. If you let the pain win, usually that is when fear sets in. By jumping up quickly and going right back after the thing that hurt you, you reduce letting fear stop you. In your business you’re going to be experience pain. It may not a twisted ankle or a broken wrist. Instead you may suffer from hurt feelings, a bruised ego, or a broken heart even. But you have to get right back in the game. If you throw a pity party over every lost deal or project gone bad, it may keep you from moving forward on another opportunity. When you start, you have to commit. If you hesitate you risk getting hurt. Sometimes in business, you have to decide to do something and make the commitment to follow through. If you hesitate, you risk failing. You risk your competition getting an edge. So commit. 7. Going fast is better than going slow. When you first start skating this makes no sense… but the more you skate the more you understand its truth. The fast you go the better you stick to the wall. The faster you push, the easier it becomes to get higher and land more tricks. In business, sometimes going faster is better. We live in a world with an economy that is always changing. Technology is progressing every day. The slower you are to adapt to change, to adopt new technology, the further behind you are going to fall. 8. You gotta psych yourself out. Face your fear. And go for it. 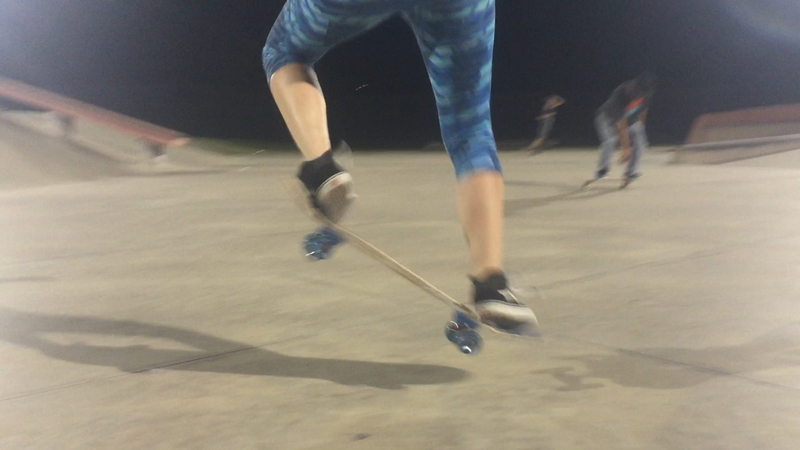 Most of the stuff I have learned in skating was extremely scary at first. In these moments I really have to psych myself out. All the fears and potential pain stare me in the face it would be easier to walk away than to try. But it feels so incredible when you’ve pushed past the thing that scares you and you succeed. Yes, sometimes you have to talk yourself into taking a big risk. Hey, falling is part of it, you can’t let that stop you before you even start! Skating is a small community. It’s a family. If you’re not nice people won’t like you. If they don’t like you then they won’t be as inclined to be nice to you in return. The same is true in business. Be nice to those around you. You never know when you might fall and need some help. And if you haven’t been nice, then you might find yourself without anyone there to help you in your time of need. I see more apologies in the skatepark than I see anywhere else. Collisions happen. Everyone is going fast, and sometimes it just can’t be helped. But when it happens, apologize. Skaters are always turning to each other with “sorry” or “my bad”, and then skate on. It’s part of it. Recognize your part in the collisions that happen in business and own up to it. And then skate on. 11. Keep your head up. Pay attention to where others are going. If you skate with your head down, staring at your feet, you’re going to run into someone or something. You have to look up and pay attention to what everyone else is doing. It’s the best way to avoid a collision. In business, you’ve got to pay attention to new trends, new competitors, new threats, and even new opportunities. If you have your head down focused only on what you are doing, chances are you will get knocked off your board. 12. You have to know when to bail. Sometimes skaters will push a little too hard. So they have to know when to bail. There will be times when something just doesn’t feel right. You don’t have enough speed, or someone is crossing your path, or your balance is just a little off. In certain circumstances, it is better to bail than to collide, fall, or get hurt. Knowing when to bail (and how to bail) is a learned skill. And in business, the harder you push, the more risk you take, the more falls you’ve had, the better you will get at knowing when it is time to bail from a project, from a client, from a partnership, etc. It’s not what we want to do, but sometimes we just need to bail to save ourselves from something worse than pushing forward. Andra Dunn has long held a passion for utilizing technology to drive marketing and communications efforts. In the ever-changing world of digital marketing, Andra has spent the past fifteen years refining her industry knowledge and applying her expertise in helping small businesses and non-profits tell their stories and effectively engage their audiences.